All our Wool Sweaters and Knitwear are Handcrafted in Norway and shipped direct to you from Norway by standard Air postal services which takes on average to any European country 5 - 7 working business days. (excluding weekends and any bank holidays). Italiane) France (La Poste) etc. Please note therefore that we cannot be held responsible for delays in delivery due to Customs clearance as we have no control over this process. If you wish your order to be registered and tracked this will cost £29.95 extra. Orders are usually shipped within one working day after payment is made, unless the garment is temporarily out of stock. All prices quoted on this website are accurate at the time of publication and are quoted in UK Pounds Sterling (£) and where appropriate are inclusive of sales tax at the current rate. If your order is being despatched to a destination outside of the European Union (EU) then your sales tax will be zero. Any customs or import duties levied once the package reaches your destination country will be your sole responsibility as we have no control over these charges and cannot predict them. Faster priority Shipping with tracking can be arranged via UPS if you require your order faster. Please contact us for a firm quotation to your country. Please ask us for a quote if you live outside of Europe as the cost will be considerably more for this faster delivery service through UPS. All orders over £100.00 are shipped FREE within the UK and Europe. For all orders under £100.00 our minimum shipping charge of £16 applies. All orders over £100.00 are shipped FREE (standard airmail) outside Europe. 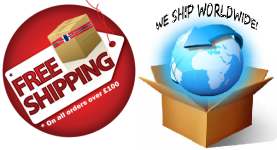 For all orders under £100.00 our minimum shipping charge of £24.00 applies. All international orders are marked with the description of contents for local customs. You may be responsible for local import taxes in your specific country. Customs or import duties are levied once the package reaches your country. Customs and import duty policies vary widely from one country to another. Please contact your local Customs office for further information. All orders are sent via Airmail by Royal Mail Standard Delivery and can take between 7-14 business days for delivery. Some states do take longer than others to receive their mail. Unfortunately this is a USPS issue. We must ask US customers to be very patient - we have sent out many replacement parcels in the past, only to see the original ordered package arrive before the replacement. International packages will take longer to arrive than domestic orders as the package is travelling a further distance. Once the parcel is in your country, it will also pass through your customs office which can add time to the delivery. Customs can hold a parcel for several weeks and open up packages for inspection. Usually international packages arrive somewhere within 3 weeks but can take longer depending on the Post Office and customs clearance in your country. Unfortunately, there is nothing as sellers we can do to speed up the process. Please allow sufficient time for your package to arrive before contacting us.